Remember those lotion commercials from a few years back that featured an alligator roaming around, showing us all how dry, cracked, and just overall unappealing our skin can look because winter is so desolate? And, apparently, this year so snowless. Well, Green Envee Organics can help fix that. Your moisture-sapped skin, that is, not Chicago’s snow deficiency. Their body care products are all natural and all organic. If that weren’t enough, they’re also all fair trade. Personally, I’m eyeing up their Nature Cares Shea Body Lotion (pictured above) for this winter because shea butter is King. They’ve made a name for themselves in the natural spa industry, so if you feel like indulging yourself or someone you care about this holiday season, this might be one way to go. For Chicago citizens, they have a shop located just off the Grand Red Line station. For the rest of you fine folk, you can order their products online. 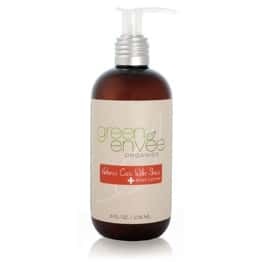 Green Envee Organics is 100% truly plant based Body and Skin Care Company. We make products such as hand & body lotion, body scrubs, bar and liquid soap, as well as professional spa products. Green Envee Organics believes in making products for our minds, bodies, and spirits utilizing ingredients that only nature can provide. After working with a few local independent designers we found that it was hard to get the look we were going for. We had spent large amounts of money trying to obtain the desired look and feel for our website and logo. We learned that every designer has their own style and it is not always easy to get them to conform to your companies particular style. This is when we turned to crowdSPRING. Leaning that we could have many designs to choose from was just what we were looking for. It is great that you can work with many designers simultaneously through the process to get the results we needed. One of our major challenges in the natural body care arena is that there are a lot of large companies with very appealing websites and marketing material. It is tough to compete without an upscale look and its tougher to get an upscale look without spending an arm and a leg. Price point on our products are another challenge that we face. We wanted to create a product line that has quality ingredients that actually heal the body. Our products are competitively priced with higher end products but, we need the look to be able to do that. Thanks to crowdSPRING we are able to overcome these challenges. Our largest learning curve was to find the correct marketing strategy for our product line. We have spent the last few years trying to find the correct niche industry and learning how to market to that industry. We have tried everything from straight retail to wholesale gift shows. We have finally landed on an industry that suits us well. The natural spa industry has welcomed our products with open arms. The most amazing and rewarding story from our start is the fact that 2 cousins Tim and Bob both born in rural Wisconsin could come together to create a product that has been so successful in the natural body care industry. It is kind of crazy that 2 28 year old guys would start creating products to beautify the world’s people and it actually works. We get rewarded almost daily from our customers telling us about how our product line has improved various skin conditions for them and their families. We have worked to gain a small market share in spas across the country. We will continue to broaden this concept while creating a “Green Envee Partner Network” where we will drive leads to these partner spas. We would also like to open a school that focuses on using natural ingredients during treatments in the spa world. We believe that going back to change what some perceive as challenges would not necessarily be a good thing. Our philosophy on facing challenges is it is the price you pay for “The School of Life & Business”. Some of us choose college. That usually costs time and money. Same in business. Challenges arise and you usually have to spend resources to overcome them. In the end it is the cost of and education and that is priceless. Green Envee Organics’ call for an uncoded website received 60 entries. Interested in having your small business featured? Email smallbiz@crowdspring.com!